Blowout Sale! Free Shipping Included! 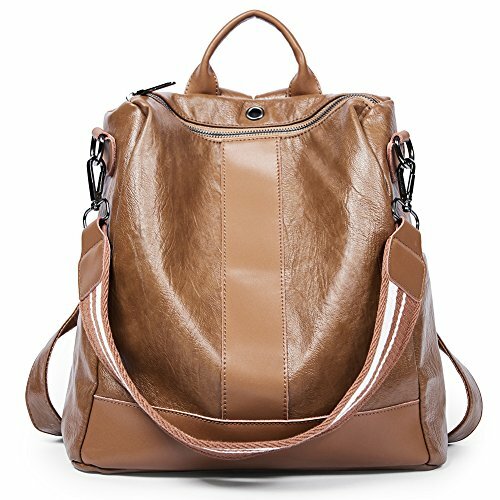 Save 76% on the Women Backpack Purse PU Leather Covertible School Shoulder Bag Fashion Ladies Travel Bag brown by Romere at Purse Outlet Coach. Hurry! Limited time offer. Offer valid only while supplies last. ★This Backpack is updated in a softer, more lightweight construction with striking luxurious PU leather and a touch of Americana-inspired leisure. ★This Backpack is updated in a softer, more lightweight construction with striking luxurious PU leather and a touch of Americana-inspired leisure. Bright shiny hardware gives it the same charm attitude as the original. Embrace the laid-back luxury of soft PU leather backpack, featuring a number of pockets to tote all of your stylish essentials. ❤ Made of high quality soft durable PU leather, metal zippers and fabric lining, fashionable and durable. ❤ Multi-pockets provide enough space for your items, including 1 main compartment with 1 interior zipper pocket and 2 interior pockets; 2 side pockets (for water bottle, triple folding umbrellas); 1 zipper pocket in back (for IC cards, important things). You could store your things orderly. ❤ The top come with a headphone hole. A headphone hole above the zipper for you to put the phone inside the bag, headphones out of the headphone hole out to listen to songs. ❤ The rear zipper pocket of the backpack can protect your items from being stolen. ❤ The lightweight and fashionable backpack can be used as a school bookbag, travel daypack, shopping bag and etc. 2.Please allow 1-2cm measurement error because the size is measured by hand. 3.Each backpack will be check carefully before shipped, but it's still very hard to guarantee there's no extra thread. 4.Dear Buyer: Thanks for your purchase! Your positive feedback will be greatly appreciated! [HIGH-END MATERIAL]: This backpack is made of high quality Soft PU leather, metal zippers and fabric lining, which is fashionable and durable. [PRACTICAL STRUCTURE]: 1 main zipper compartment with 1 interior zipper pocket and 2 interior pockets, 2 side pockets and 1 back zipper pocket . This stylish backpack can hold your daily essentials, like triple folding umbrellas, books, cell phone, mini pad and so on. [DIMENSIOIN & WEIGHT]: (L) 12.60 x (W) 5.51 x (H) 12.99 inches, 1.63 pounds.Handle drops: 3.14", It's convenient and lightweight for you to carry everywhere you want. [WELL-DESIGNED] :The strap of backpack is adjustable. And you can carry it as a single-shoulder bag or backpack as there is a removable short shoulder strap. The top come with a headphone hole; Back zip pocket, Anti-theft backpack. If you have any questions about this product by Romere, contact us by completing and submitting the form below. If you are looking for a specif part number, please include it with your message.